Granola is crunchy and delicious; a favorite indulgence of kids and adults alike. But granola can be seriously not good for you! High in added sugar and processed fats, makes purchasing granola a bit tricky. In fact, I’ve never found a granola that doesn’t contain any added sugar; so I made my own. Granola still packs a punch of calories, but in this recipe they are all “good calories”; the kind of calories that work for you, not against you. Partner this granola with a bowl of berries or diced fruit and few spoons of plain yogurt and you’ve got a filling breakfast or snack. Granola is surprisingly easy to make yourself. Not only is granola expensive nutritionally, it’s also hard on the pocketbook. Make your own to save some cals and some cash. I saw a recipe online that made a paste from dates to naturally sweeten the granola, which I thought was a great idea, but I didn’t have dates. I made mine with raisins because I didn’t have any dates. *Note: Ingredients with an asterisk need to be confirmed gluten-free for those with celiac. In a small saucepan, simmer 1/4 cup raisins and water. Once plump and softened, puree in a blender to make a paste. Mix the walnuts, coconut, oats, 1/2 cup raisins, canola oil, vanilla, cloves and cinnamon with the raisin puree. Add a bit of water to moisten the granola. 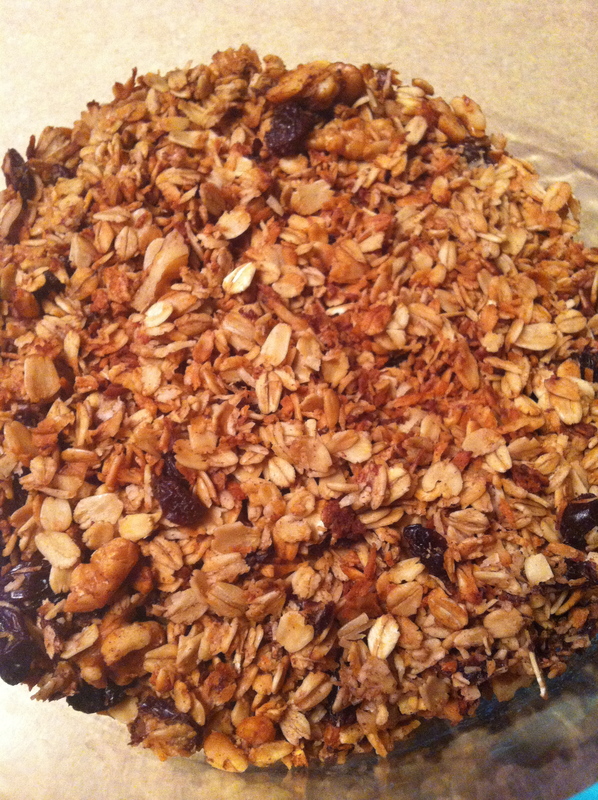 Spread the granola into the pan and bake for 30 minutes, stirring after 15 minutes or if the edges get brown. Here it is in the baking dish ready to bake. Keep in mind that granola can be super simple. This weekend I didn’t have a lot of time, or ingredients, but I really didn’t want to spend $6 on another puny bag of gluten-free granola. Rather than stressing over the specialty dried fruit and sunflower seeds I didn’t have, I used the oats and pecans that I did have. First, I simmered a large handful of raisins in about 1/2 cup water until they were plump, almost falling apart. I just set that on the back burner of the stove while I was doing other things around the house. Once the raisins were nice and soft, I let them cool a bit while I mixed up the oats, pecans and cinnamon. I like to put a lot of nuts in my granola so that it is filling and satifying. Without the healthy fats from the nuts, the carbohydrate from the oats and fruit just is sustaining. Don’t worry about how much nuts or oats, just do what seems like a mix you’d like to eat. Next, blend the raisins and water into a puree and pour the raisin puree over the oats and pecans. Add extra flavor with cinnamon and vanilla. I finished my granola off with a drizzle of non-GMO canola oil and threw it in the oven. Simple and delish! What Will You Do to Celebrate Food Day? I made this granola this morning, it was DELICIOUS! My family loved waking up to the smell. But…mine didn’t get crunchy? I turned up the heat and left it in about 10 mins longer and it browned up a little, but not crunchy – more date paste? Too much water? It didn’t seem very wet when I put it on the oven. Hmmm…yea, maybe bake it longer and at a higher heat? Not sure what elevation does to the heat settings on the oven. I baked it until it was almost burning on the edges. Stir a couple times and bake it longer…. Ooh, forgot to add that I didn’t have ground cloves so I used ginger – yum! Nice choice on the ginger! Give me a call back tomorrow. I’ll be in the office. I’m glad to hear you got your Prothera products. Do you know approximately how long this granola will keep after being made? I don’t want to make too much if it is just me eating it. Can you puree the fruit by hand or do I have to use a processor? The granola keeps a pretty long time if you freeze it. In the pantry it will keep about 2 weeks. If you cook the fruit well, until it is very soft, you could puree it by hand. A hand held immersion blender would also be handy to puree the fruit. Made it today. I used my magic bullet with some added water to puree it and it worked great. Also added some chia seed since I had some in the house. I baked mine for an hour. Yay! Good call with the Magic Bullet. Thanks for sharing that tip.